Deputy President William Ruto addresses Kitengela residents (file photo). It was Mr Ruto's first lecture at Chatham House and he joins President Uhuru Kenyatta and ODM leader Raila Odinga as some of the Kenyan leaders who have had the privilege to address it. 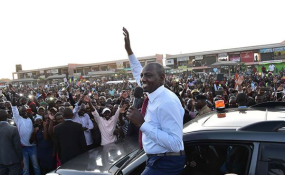 Back home, Mr Ruto's movements across the country have been hit by lack of cash in his office as well as a sustained public pressure from his boss President Kenyatta that there should no politicking until campaigns officially start. Senate Majority Leader Kipchumba Murkomen acknowledged that Mr Ruto's foreign visits have increased in Jubilees second term but attributed it to the "unique circumstances" of the first term. "During the first term, there was the International Criminal Court matters. Those were personal issues and a foreign visit would have been interpreted as if he is trying to lobby for himself. You also acknowledge that the President was also travelling more," he said. "The DP does not travel on his own behalf. It's a diplomatic visit done with the blessings and on behalf of the country's number one diplomat, the President. If there will be more travels it will be dependent on the arrangements the President and his deputy have." "The national government should be reconfigured to comprise the National Executive (headed by the President) and the official opposition (headed by the leader of the party or coalition of parties whose presidential candidate wins the second highest votes). I further propose that with the leader of opposition taking leadership of the opposition in parliament, the DP should then take over the leadership of government business in Parliament," he said. "You will see the DP more and more meeting university students across the country in their own universities. This will help connect with them and answer all burning questions that may crop up," said a source. In this Jubilee's second term, Mr Ruto has intensified his diplomatic mission that insiders say is part of a broader strategy to enhance his international image ahead of the 2022 elections. "Kenya is ripe for investment, we urge our nationals in the diaspora to seize opportunities back home and repatriate their expertise to advance economic progress," Mr Ruto said during a recent trip in Rome, Italy.